Faye Business Systems Group, leading CRM and ERP software implementation and integration specialists, and known for their innovative software integrations, has released their SugarCRM NetSuite ERP Integration. NetSuite Solutions Provider and SugarCRM Elite Partner Faye Business Systems Group announced today the availability of their SugarCRM NetSuite Integration Application. Faye Business Systems Group has cornered the market as the leading SugarCRM integrator. After becoming a NetSuite Solution Provider in 2014, and earning SugarCRM Elite Partner status in January of 2015, FayeBSG has applied their 25 years of CRM and ERP expertise and success in the release of their highly anticipated SugarCRM NetSuite ERP integration. NetSuite is The World’s #1 Cloud-based ERP Software. SugarCRM is the most innovative and affordable customer relationship management (CRM) solution on the market. The FayeBSG SugarCRM NetSuite ERP integration application brings the full functionality of NetSuite to Sugar. With the Sugar NetSuite integration, users can create quotes or sales orders in NetSuite in real time, directly from Sugar. 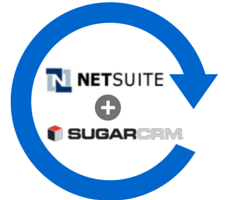 With NetSuite’s financials integrated with Sugar, organizations benefit from a totally seamless connector that allows the sales force to gain capabilities beyond traditional CRM, with expanded visibility into detailed NetSuite fulfillment and invoicing information directly from within Sugar. The web-based solutions provided by NetSuite provide proven financial/ERP capabilities to integrate an organizations back-office, sales and service processes. With a single, integrated platform, users can automate key business functions across all departments, including sales, marketing, service, finance, inventory, order fulfillment, purchasing, and employee management. FayeBSG integrations allow companies to utilize best-in-class software without missing out on critical integration components. A 2014 Inc. 5000 Honoree, FayeBSG are software and technology specialists with extensive expertise in CRM and ERP software. A SugarCRM Elite Partner, and Sage and Act-On Platinum Partners, Faye’s in-house team of developers and consultants work on an ongoing basis to not only develop the most sought after integrations, but also to consistently upgrade and update integrations for optimal performance, and to add user requested features. Their integrations are well thought-out and consist of the most complete operational functions. FayeBSG specializes in a variety of custom software solutions to meet client needs. Services include software development, project management, packaged software implementations, custom software implementations, integration, consulting, training, and support. Faye Business Systems Group has completed hundreds of successful CRM and ERP projects, specializes in Sugar Integrations, and is one of SugarCRM's leading Elite Partners. As a NetSuite Solutions Provider, FayeBSG are certified business application experts with the ability to deliver complete NetSuite cloud computing solutions, from selling NetSuite licenses to implementation and support. For more information, call (818) 280 - 4820, email info(at)fayebsg(dot)com, or visit http://www.fayebsg.com. Connect with Faye Business Systems Group on LinkedIn, Facebook, Twitter or YouTube. NetSuite Inc. is the industry's leading provider of cloud-based financials / ERP software suites. NetSuite enables companies to manage core key business operations in a single system, which includes Enterprise Resource Planning (ERP), Accounting, Customer Relationship Management (CRM), and Ecommerce. NetSuite's patent-pending "real-time dashboard" technology provides an easy-to-use view into up-to-date, role-specific business information. For more information about NetSuite Inc., please visit http://www.netsuite.com. SugarCRM enables businesses to create extraordinary customer relationships with the most innovative and affordable customer relationship management (CRM) solution on the market. By placing the individual at the center of its solution, SugarCRM is putting the “i” in CRM and empowering people at all levels of an organization to better understand and engage with customers. Based in Silicon Valley, SugarCRM is backed by Goldman Sachs, Draper Fisher Jurvetson, NEA, and Walden International. More than 1.5M individuals in over 120 countries rely on SugarCRM. To learn more visit SugarCRM.com or follow @SugarCRM.